10-Strike Software is a network software developing company. The product line includes network monitoring software, computer inventory software, network mapping and management software, LAN topology discovery and diagramming program, file searching program, bandwidth monitoring and Internet traffic usage tool, and share remote user access auditing program. We sell our products world-wide since 1999. In 2003, the company concentrated on creating and marketing administrative and networking applications (primarily for the Windows platform). "10-Strike Network Inventory Explorer" is a powerful computer inventory software which allows you to maintain the network computer inventory database. View hardware and software on computers remotely, track hardware and software changes, plan upgrades, generate reports on installed applications and hardware, mine data and export it to your database. The Pro version has got advanced SAM functions. "10-Strike Network Monitor" is a monitoring program which allows you to obtain online data on the time a device becomes available and the time it goes out, and thus ensure a prompt response to various events. See response times graphs in real-time, configure alerts, and be notified when your services work slower or go down. "10-Strike LANState" is a simple NMS. This visual network mapper and monitor allows you to see the state of your network at any time on a graphical map. Monitor your servers, switches, drives, services, and databases in real time. Configure alerts and be notified on failures or any other specific events. Manage your hosts, workstations, and servers using the program's visual LAN map. "10-Strike Bandwidth Monitor" is a traffic and bandwidth monitoring program which allows you to obtain online data on the traffic volume utilized by hosts on your LAN (switches, computers, routers, etc. ), calculates and displays the current bandwidth. See the bandwidth graphs in real-time, configure alerts and be notified when hosts download more traffic than the configured limit. "10-Strike Network Diagram" builds diagrams of local networks and draws network topology by scanning switches using the SNMP protocol. The program contains a feature-rich diagram editor and an object library with a wide range of device icons. You can save diagrams in popular graphical formats, copy and paste it to a document, or export it to Microsoft Visio for further processing. Or edit network diagrams just in our program because it is much faster than Visio! "10-Strike LANState" does the network diagramming as well (using the same scanning engine). But in addition to the network mapping functions, LANState monitors the mapped hosts in the real time displaying state of your hosts as icons on a graphical map. You can always see active and inactive hosts. This basic NMS allows you to discover new hosts, monitor switch ports and other parameters via SNMP, and manage Windows computers. "10-Strike Network Scanner" is a free lightweight TCP port scanner and network address detecting software. Scan your LAN, find all connected devices, and detect their addresses in a few seconds when you need. The program is free! Moreover, the tool has got some advanced admin features like remote power on and off for PCs, access to remote registry and Event Log. The "10-Strike Network File Search" program can search files on your LAN shares and FTP servers. Specify a search string, quickly find the necessary files, and save handy reports. The program uses fast multithreading searching engine and works very fast. It allows you to search content in documents as well. "10-Strike Connection Monitor" monitors remote users' connections and their access to shares, shared folders, and files, records all sessions to a log file. The program generates screen, sound, and e-mail notifications on connections. Monitor file and folder access, log file deletion and creation. The log file stores the exhaustive data on connected users, folders and files accessed. 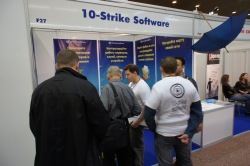 10-Strike Software has resellers worldwide. Primary resellers are located in the USA, Germany, Russian Federation, Japan, Switzerland, and Turkey. Our networking products are installed and used in many thousands of organizations all over the world. Free products have hundreds of thousands installations. The company takes part in various IT events like expos and conferences all over the world. Find a Solution for You!